7 States, Delhi is synonymous with excellent food and perfect caterers to satisfy your guests with delectables. Their outlet strategically located in Connaught Place, Delhi, is renowned for bringing cuisines of seven different states of India to its capital under one roof so they are offering a catering menu. They serve seven different cuisines all the way from Punjab, Rajasthan, Gujarat, Hyderabad, Kerala, Jammu Kashmir and U.P with the extra zing and a blend of flavours and aroma. This unique concept makes us distinct and sets them apart from others. They have state-of-the-art chefs who are in love with cooking and have travelled comprehensively in India in search of unique recipes and flavours. Thus, they take great pride in the fact that they have the power of re-inventing cultural Indian platters with their talent. They are friendly and warm staff always strives hard to guide their customers through the menus and dishes as per their taste, offering them impeccable hospitality that they always deserve. Contact 7 States, Delhi today and get the feeling of being transported to different regions of India with every bite to your guests. 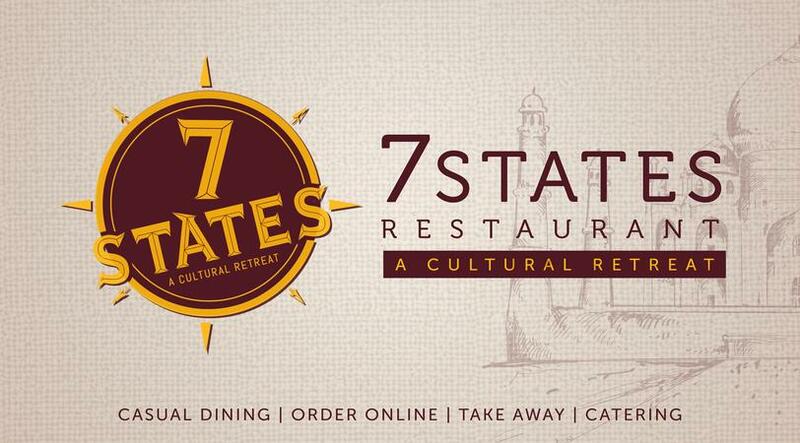 7 States is a caterer based out of Connaught Place, Delhi . 7 States's telephone number is 76-66-77-88-99, 7 States website address is http://7states.co.in, Facebook page is 7 States and address is 25/42 block a middle circle Connaught place, New Delhi. In terms of pricing 7 States offers various packages starting at Rs 600/-. There are 0 albums here at Weddingz -- suggest you have a look. Call weddingz.in to book 7 States at guaranteed prices and with peace of mind.